The myopia of the political right never ceases to amaze. On the weekend after Theresa May's deal capitulation on the first phase of Brexit negotiations the Spectator published a piece warning that the Tory government must wake up to the dangers of fake news before it's too late. Of course I have no quarrel with the central premise of the article that fake news is a huge problem. Nobody is denying that Twitter and other social media platforms are awash with automated bots pushing vast tides of deliberate political disinformation into the news feeds and inboxes of millions of people. The problem of course is that fake news isn't just limited to Russian bots, white supremacists, extreme-right activists, and the like. As much as the mainstream media and the political establishment would love to convince you that they're the only true sources of reliable information in an ocean of disinformation, they're often guilty of disseminating fake news to the kind of vast audiences that the owners of Russian Twitter bot farms could only dream of. Mainstream news sites from across the political spectrum have been caught promoting distortions, exaggerations, misleading narratives, and outright lies. Surely we can all think of plenty of examples of newspapers and broadcasters producing shockingly misleading content for ourselves? In fact it's been proven that mainstream media hacks have massively amplified the popularity and reach of Russian Twitter bots and other fake news purveyors by lazily embedding their Tweets into their articles instead of engaging in actual journalism. But aside from the mainstream press doing stuff like brazenly misrepresenting statistics to whip up hate against British Muslims, repeatedly inventing fake terrorist incidents, embedding Russian bot tweets in their articles, and concocting stories out of outright lies they've lazily churnalised off the Guido Fawkes blog, there's a subtler but more sinister form of fakery going on. 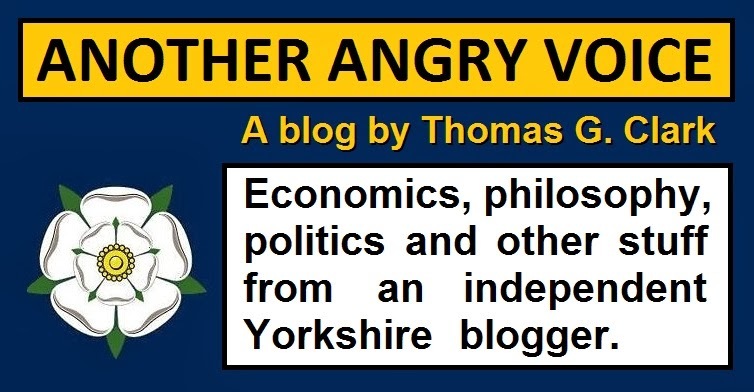 Take the British Medical Journal research paper linking 120,000 excess deaths with Tory austerity dogma that the BBC decided not to mention at all. The astounding decision to hide the existence of this damning report from the public revealed that the BBC is more of a PR department for the political establishment than an impartial broadcaster. Then there's the fact that the BBC continually gives credence to fringe lunatics with their fake balance agenda so that qualified climate scientists are given the same platform and airtime as clueless blowhard climate change denialists like Nigel Lawson. But the BBC obsession with creating fake balance (even between experts and extremists when it comes to subjects like climate change) suddenly evaporates completely when it comes to economics. At the 2017 General Election the British public were split almost exactly 50-50 between supporting pro- and anti- austerity parties. You wouldn't know that watching BBC political output though, which insists on heavily stacking almost all of its debates and politics shows with pro-austerity politicians and political commentators, as if the idea of economic impartiality is an absurd concept, rather than something that should absolutely be expected from a taxpayer funded public service broadcaster. Mainstream newspapers and broadcasters are demonstrably guilty of creating and disseminating fake news, and of deliberately manipulating public perceptions. But there's also the problem of politicians creating fake news themselves too. We've all seen how the "£350 million a week for the NHS" and "only a madman would try to drag the UK out of the Single Market and Customs Union" Brexiteer lies have crumbled away to reveal a hard Tory Brexit and a vast 50 billion divorce bill. We all saw how Donald Trump won the US election promising universal health care to the American people before immediately launching attack after attack on America's very limited socialised health care provisions in order to deny coverage to literally millions of people. 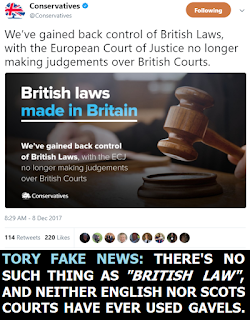 And anyone who uses Twitter will be aware of the Tory party accounts @CCHQ and @Conservatives which both spew a near constant stream of pro-Tory fake news. 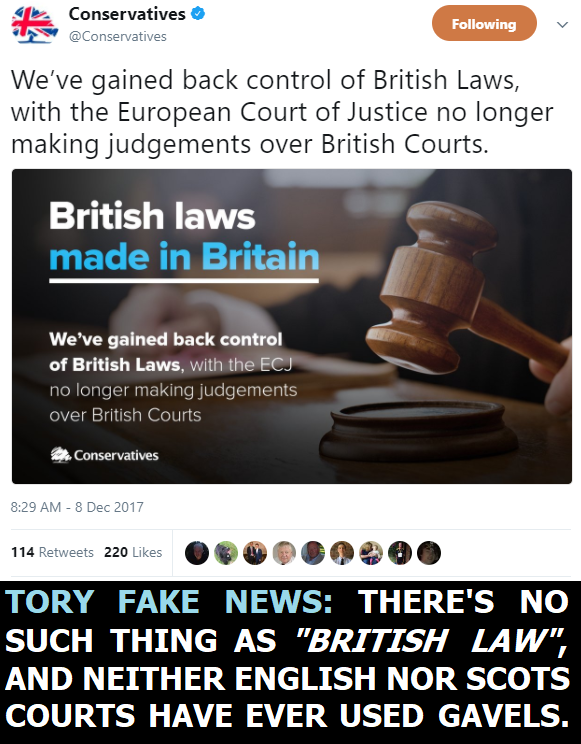 On the day before the Spectator article pleading with the Tories to take fake news seriously the @Conservatives account published an extraordinarily misleading Tweet claiming that there is such a thing as British law (there isn't because Scots Law and English Law are two distinct legal systems) and using a picture of a gavel to illustrate it (gavels have never ever been used in Scots or English courts). On the very same day Tory MPs conducted an absolute barrage of Twitter propaganda trying to recast Theresa May as some kind of master-negotiator for having finally crawled over the first Brexit hurdle a lamentable eight months after triggering Article 50 with no plan for what she wanted to achieve as an actual objective. And let's not forget that just days before Theresa May's Brexit deal capitulation her Brexit minister David Davis claimed that the Tory government has actually done no Brexit impact assessments whatever, meaning the 58 Brexit impact assessments he'd spent the summer bragging about to parliament, the press, and the public were in fact fake news. Imagine the myopia of appealing to the Tory party to do something to combat fake news when the writer knows perfectly well that Theresa May's cabinet is stuffed to the gunnels with lying Brexiteers; that the Tory party operates a pair of the most shockingly misleading official British political accounts on Twitter; that BBC political coverage is little more than taxpayer funded PR for the Tory party these days; and that Tory politicians are currently engaged in yet another Orwellian propaganda campaign, this time to convince the British public that the Brexit deal capitulation is a wonderful thing and Theresa May is some kind of exceptional master-negotiator! 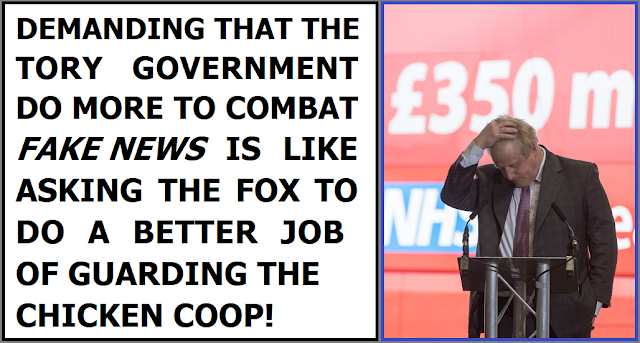 It really is like asking the fox to do a better job of guarding the chicken coop.